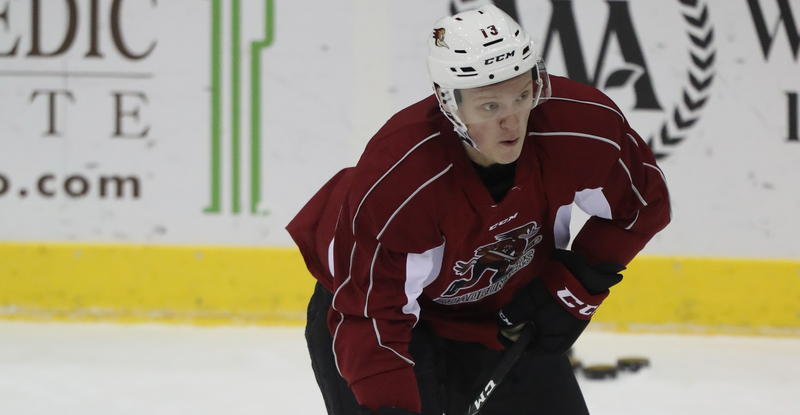 TUCSON, AZ – The Tucson Roadrunners, proud American Hockey League affiliate of the Arizona Coyotes, announced the reassignment of forward Artur Tyanulin to the Fort Wayne Komets of the ECHL today. The 20-year-old Tyanulin played in three games with Tucson this season. The 5-foot-10, 174 pounds native of Kazan, Russia has recorded 7-10-17 and 12 penalty minutes (PIM) in 13 games with Fort Wayne this season. Goaltender Sean Maguire, who was acquired by the Arizona Coyotes from the Pittsburgh Penguins, has also been assigned to Fort Wayne. The 6-foot-2, 203 pounds native of Powell River, British Columbia posted an 8-3-0 record with a 3.28 goals against average and a .910 save percentage in 12 games with Wheeling (ECHL) this season, as well as a 1-1-0 record with a 2.19 goals against average and a .924 save percentage in four games played with Wilkes-Barre/Scranton. Tickets for all 19 remaining Roadrunners home games, including Saturday Star Wars Night, are on sale now and can be purchased by clicking HERE or visiting the Tucson Convention Center box office. For more information on the club, call 866-774-6253.